When I workout early in the morning, I find it very difficult to eat beforehand. I am one of those people however that need food for fuel; especially when I go spinning. I can last for the first 20 minutes but then I progressively feel myself losing momentum and all I can think about is what I am going to make for breakfast. People often ask me what they should eat before a workout because certain foods can leave them feeling sluggish or bloated. These portion controlled bites are filled with the perfect balance of carbs, protein and healthy fats to fuel your workout. Because of their size, you can still have a full breakfast afterwords without the guilt of having two breakfasts. Their high fiber content keep you full and help keep you regular (yay)! The amazing part about these is that they require you to throw some ingredients in a food processor without any baking at all. They are a perfect on-the-go snack that feel like a special treat. I store mine in the freezer for a cold and fudgy texture. 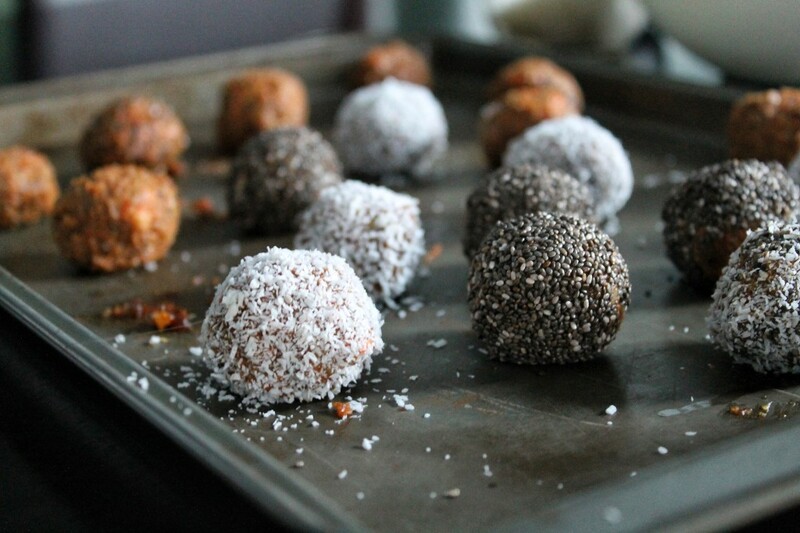 The chia seeds give a good crunch on the outside plus some added omega 3 fatty acids! I have already made a second batch this week. Zach says that these are my best creation to date. Let me know what you all think! 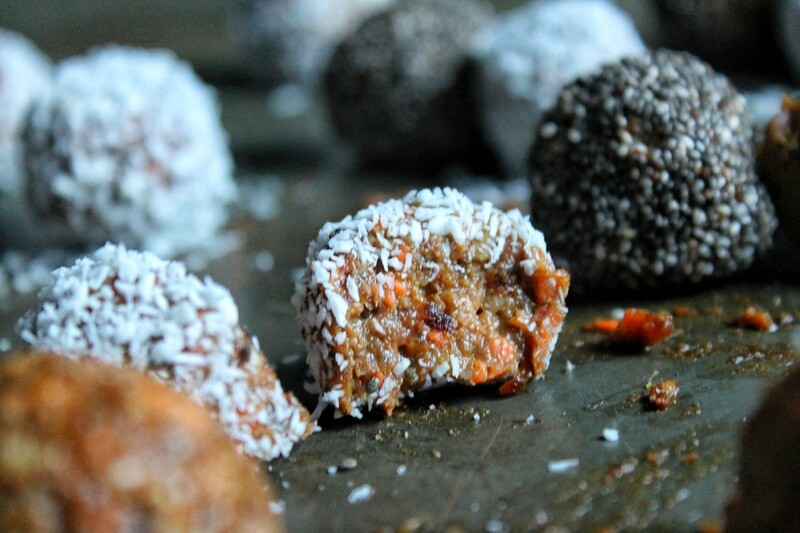 As always these are gluten, dairy and refined sugar free and this time, they are raw and vegan! Have a great weekend everyone, bon appetit. 1. Soak dates in boiling water for 10-15 minutes or until soft. This is only necessary if your dates are very hard. The point of soaking them is to easily remove the pit. If your dates are soft, you can skip this step! 2. 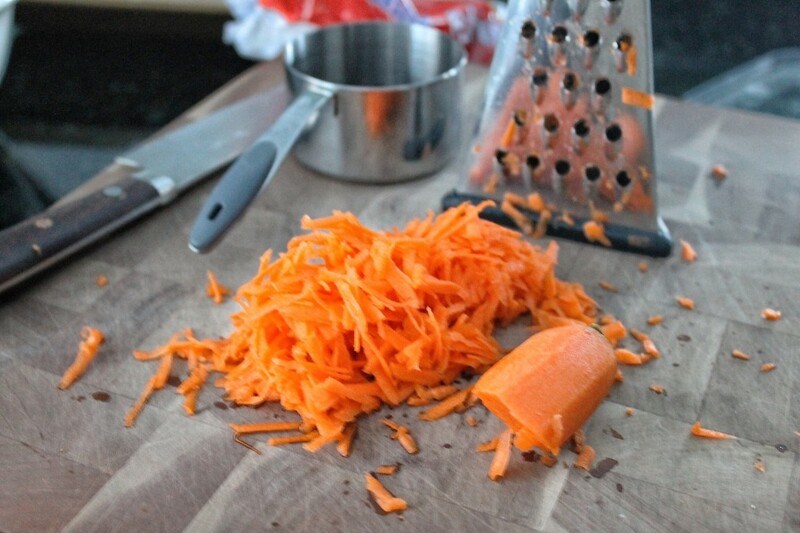 In your food processor, pulse carrots until fine. 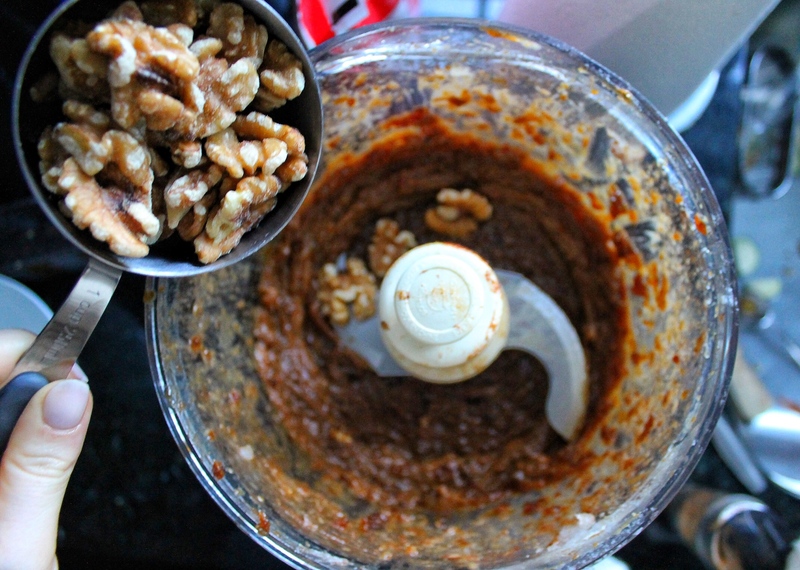 Then add walnuts and pulse. You don’t want the walnut pieces too large, but also not too fine. The point is to add texture and crunch! 3. 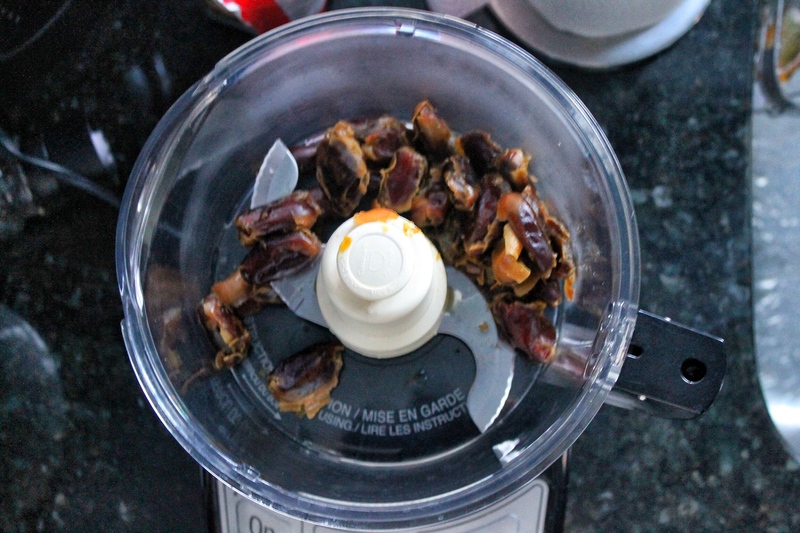 Add your pitted dates to your clean food processor and pulse until a smooth paste forms. 4. Add almond butter, coconut oil, cinnamon, lemon juice, flax seeds, maple syrup and salt. Blend until well combined. 5. Place mixture in the freezer for at least 30 minutes. This well help you roll them into balls with ease. Otherwise, the mixture will be too sticky. 6. 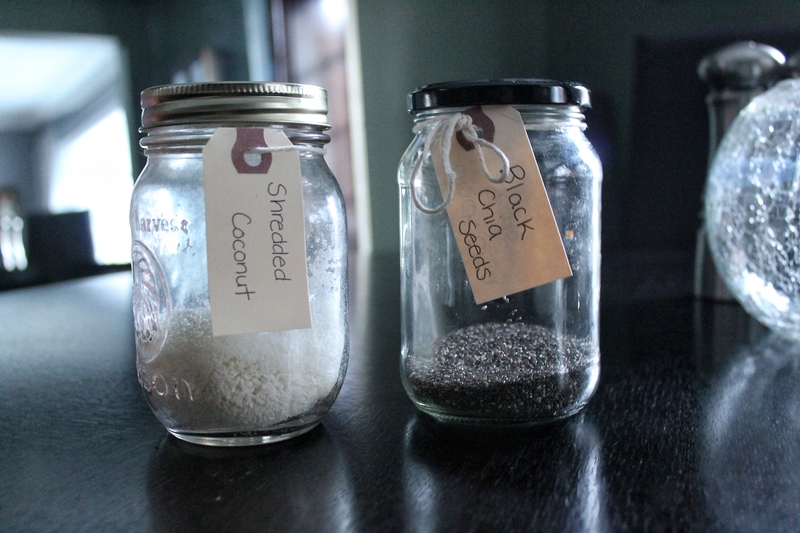 Pour chia and coconut into two medium sized bowls. Using a cookie scoop or tablespoon, scoop out mixture and roll between your hands to make a ball. Then dip the ball into desired coating and roll until fully coated. Continue until the mixture is finished. 9. Place bites into an airtight container and keep them stored in the freezer! They will not freeze, but have an amazing fudgy texture! Enjoy! OH carrot cake is my favorite cake flavor – I request it every year for my birthday! These sound amazing! Love the coconut coating on the outside. They are delicious! I hope they satisfy your craving! What amount of carrots are in these? They sound great! I think you left the carrot out of the ingredients though! Hey Tim! The amount is on there! Its just one carrot grated! Hope you enjoy! I’m definitely going to try these soon! you have to!! They are soo delicious and super easy! Holy omg. These look fantastic. I can’t wait to try my hand at these. I’m in the process of making these for a Christmas party on Friday – I can’t wait to bring them for my vegan friends! However, is it supposed to be 1 tsp or one tbsp of cinnamon added (1 tbsp is specified in your recipe)? 1 tbsp is correct! If you aren’t a big cinnamon fan, start with 1 tsp, taste and add more! I love a good cinnamon punch! I hope you and your vegan friends enjoy love! I know… it is hard to share these. good thing they are stored in the freezer! No one has to know! I tried these and they turned out great even though I did some things a bit differently. For example first I made powder of peeled almonds and mixes that with the dates, I added only half a tsp of cinnamon but it was just enough. I didn’t use flax seeds at all and I used only a hint of coconut oil. Thank you for sharing this recipe, now I won’t miss real carrot cake so much! Sounds like great substations! So glad you enjoyed! Yes, I love these kind of recipes where it’s possible to skip and reduce things you don’t love so much and still succeed. Super! Hello, would this work if I used my Vitamix blender if I don’t have a food processor? Thanks! I don’t have a Vitamix (unfortunately) but I think it should work fine! As long as you can get those dates into a paste you’ll be good to go! thanks sarah! cant wait to hang next week girl! 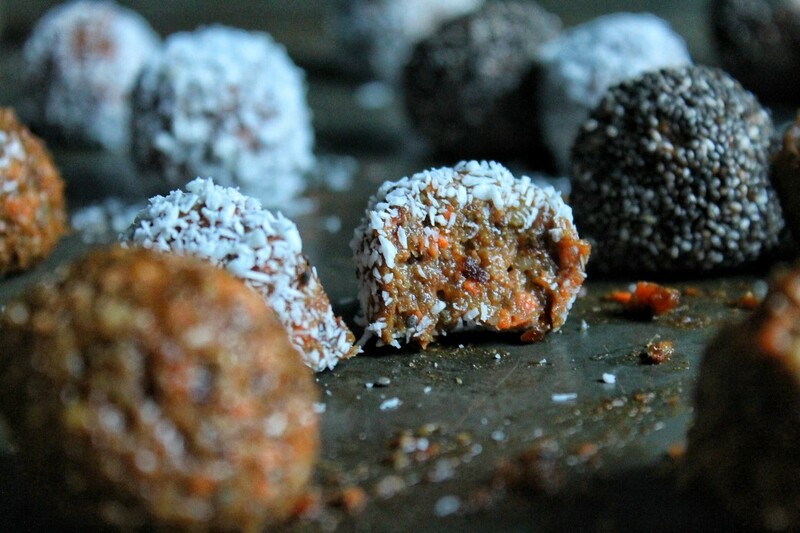 I’ve just done these bites and they are absolutely delicious ! 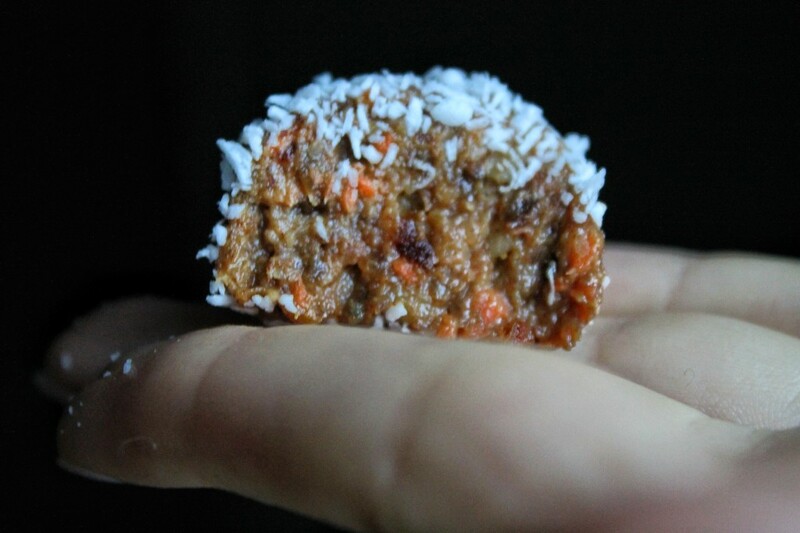 it really tastes like carrot cake, it is the perfect healthy sweet treat.